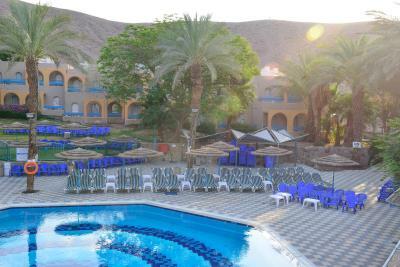 Lock in a great price for Club In Eilat - Coral Beach Villa Resort – rated 8.2 by recent guests! Comfortable room Quiet. Very good location for the beach. the location was nice and quiet breakfast was good , basic. They went above and beyond to make sure we were comfortable. We were able to check in early, we were given abundant towels and supplies in the room, there were unexpected snacks in the room (!!!) and in the lobby and everything was spacious and comfortable. We loved our experience here and will be back. Good breakfast, nice bungalows, decent cleaning. Staff was very helpful on site, but not when we contacted the property before our arrival. 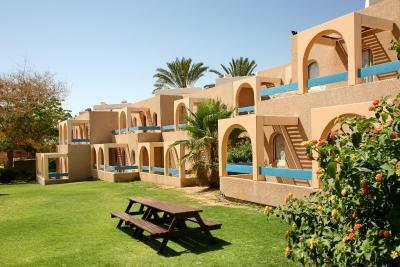 The resort has very good facilities and fair access to the beach. 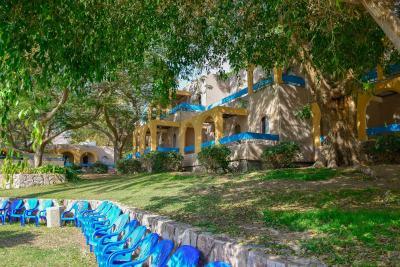 I stayed 3 nights, I read ahead of the visit and my expectations were correct, wile it is not a high end “villa” and some of the furniture was old It was exactly what I was looking for. I had my own room and so did my son, it was exactly what we were looking for. We drive any where we needed to as the city is 10 minutes away. Staff was very friendly, breakfast is not as “fancy” as most hotel breakfasts in Israel but it was more than enough. This specific room was right by the lobby so it was very good access and very close to the pool. In addition it was a very last minute booking like an hour before arrival so I greatly appreciate that! I like the layout of the hotel, the facilities on offer, the tasty breakfast, the location and the fact that overall it's very good value for money. I also noticed that this time there were a few small extras in the room, like milk in the fridge, halva, chocolates, a bottle of mineral water, and at the reception we were offered a drink on arrival, which is a nice gesture. One of our best sellers in Eilat! 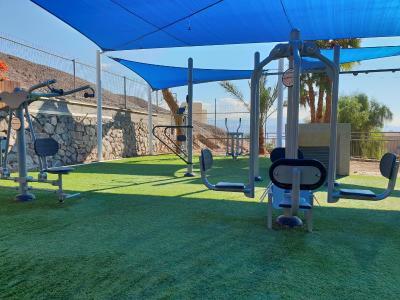 Located in a valley with views of the desert, Club In Eilat is a resort with spacious accommodations units just 1,000 feet from Almog Beach. 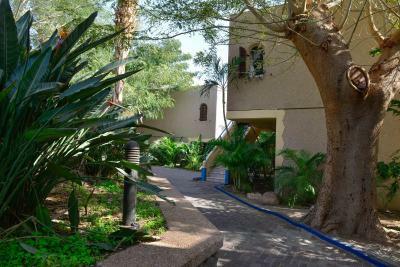 Eilat city center is 4.3 mi from this property offering free WiFi throughout. 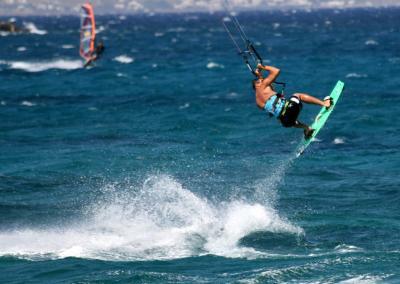 Club In Eilat offers air-conditioned rooms with kitchen, dining area, and lounge. Most have a balcony, while some have a garden view. The outdoor swimming pool is open all year round and is surrounded by sun beds and parasols. 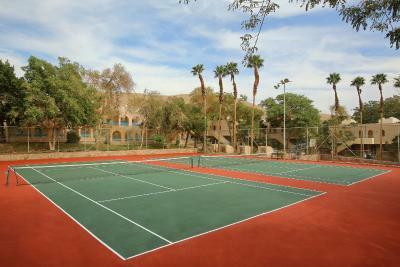 Sports facilities include tennis courts, basketball court, table tennis and ping pong tables, as well as fitness equipment. Shared barbecue facilities are available for guests to use. 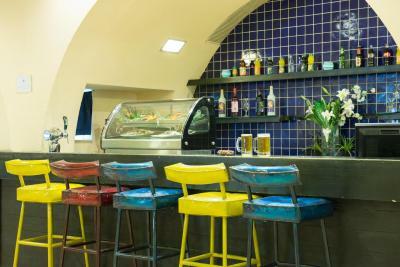 The Club In restaurant serves Israeli and international cuisine. 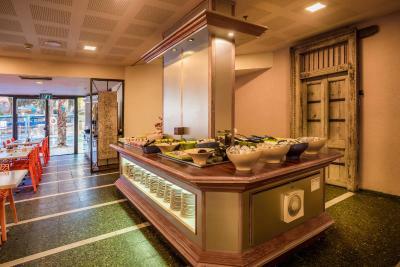 Breakfast is buffet style, and includes cheese, salad, pastries, eggs as well as fruit. There is also a supermarket on site. 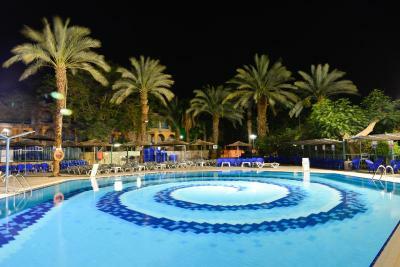 When would you like to stay at Club In Eilat - Coral Beach Villa Resort? This ground-floor unit has 2 bedrooms, a dining area, seating area and a sofa. This villa features a balcony, sofa and view. Set on the upper-floor, this unit has a microwave, kitchenware and cable TV. This suite features a balcony, microwave and dining area. This studio features a electric kettle, air conditioning and seating area. This villa has a balcony, air conditioning and kitchenware. This villa features a balcony, dining area and air conditioning. This villa has a balcony, kitchenware and seating area. This villa features a balcony, dining area and kitchenette. 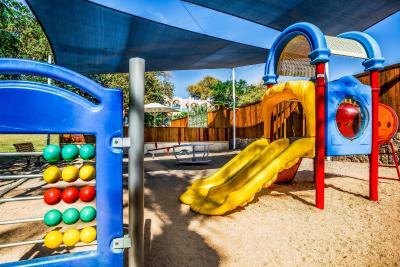 House Rules Club In Eilat - Coral Beach Villa Resort takes special requests – add in the next step! All children under 2 years are charged ILS 38.05 per person per night when using existing beds. All children under 2 years are charged ILS 38.05 per person per night in a crib. Club In Eilat - Coral Beach Villa Resort accepts these cards and reserves the right to temporarily hold an amount prior to arrival. Guests under the age of 21 can stay at the hotel only accompanied by their parents. It does not apply for policeman or soldiers who must present their ID. Please note that on Saturdays and public holidays check-in is after 18:00, and check-out is possible until 14:00. 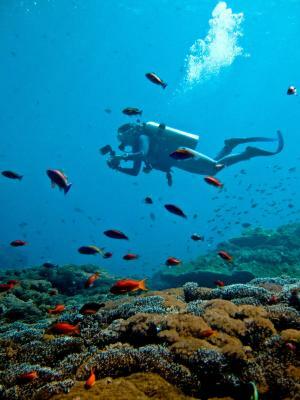 Guests are asked to wear an identification bracelet of the Club hotel Eilat during their stay. We're from Australia and have not been to Israel before, so some of this might be Israel. 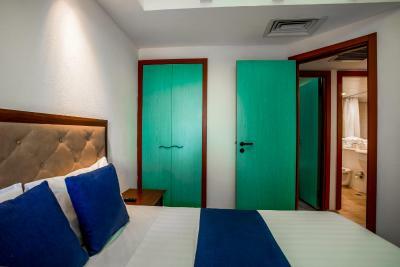 * VERY few staff spoke any English * room maintenance and general functioning was poor. Doors did not close properly, taps didn't work well, the fridge was not clean, floor sweeping was scattered, there was no information about many things one had to ask about, the holiday program for kids wasn't on most of the time, ..... So many things. Basically this is a BUDGET place, and clearly its owners are not spending a CENT they don't have to. Air conditioning in room didn’t work, when I asked for some money off the bill, was told..why didn’t I tell them. I did at the time, it wasn’t fixed, but reception staff told me it was my fault I hadn’t complained again. I felt demeaned by this attitude. Noisy, lots of young kids. staff friendly, on site supermarket and cafe, good breakfast, good size rooms. Mr. David at the reception is very helpful and kind. The hotel was very busy and crowded but we feel comfortable and stayed cool in our villa. Thank you again David! Door way into the room 251 was bad. hit the kitchen and people coming in and out. we were with a baby and it was hard. I should have asked to switched the room but people were sick. 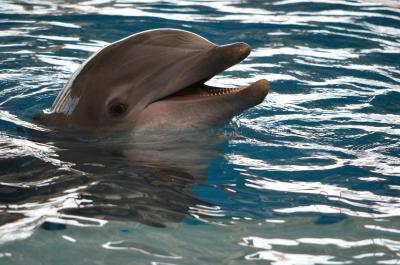 We really enjoyed our stay, the resort offers excellent value and the staff where incredibly helpful. Tired, peeling, music piped on premises. The electricity outage one morning, but it did not depend on the property but all the street was affected. Spacious appartment with everything we needed. High-speed internet connection. Rich breakfast. Low-cost property with plenty of amenities! They told us about pool renovations when we came. The information should be given earlier. We were about resting on the pool, so information about closed pool and all area was shocking. After small talk we were transferred to their other hotel with higher standard at the same price. We were satisfied with the solution. I stay without braekfast,but hospitality in hotel was exelent.